Despite this, the union has no intention of giving up. It does however need to discuss strategies for organizing in the workplace when faced with such repression. Such actions of the bosses are given the green light in Poland and even supported by the state, such as in the case of the Post Office, where a number of dismissals were made as reprisals. In one case, a worker has won very large compensation but does not want to return to work their, due to the very poor working conditions and the large possibility of being harrassed and discriminated against in working assignments. 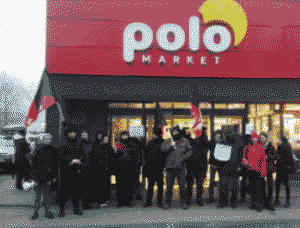 We see that the PO has been forced to raise wages due to the ongoing campaign carried out by our comrades. This is definitely a victory. But a partial one as it does not fulfill the wage demands brought forward by the workers who organized outside of the mainstream unions. The Post Office is also fighting against recognition of the union, even of groups of workers who decided to register themselves. However, this formal recognition is not what gives workers power or not – it is their militancy (or lack of it). These long-term campaigns have required our focus, so in the past year there have been fewer actions related to issues such as wage theft – but are few successes took place in this area also, such as against wage theft in a Warsaw shoe shop chain and against denial of pay for sick leave in companies such as Amazon and a number of small firms. Dialogue has been opened with Indian workers who have started to take small steps to assert their rights in the workforce. Finally, the union maintains its activities in other areas, such as tenant organization, where there have been very concrete victories, including decisions to deprivatize and remunicipalize some buildings.